* Air-dried clay is sure to expand your creativity and add dimension to your art pieces and scrap booking pages. * It is a media that will allow you to design cards, scrap booking embellishments, home décor items, free form sculpting, mold making, and jewelry. * It is only limited by your creativity. 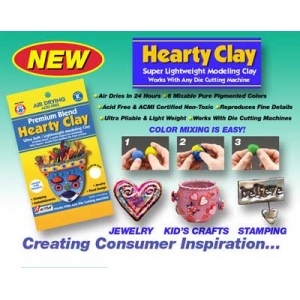 * Hearty Clay comes in 6 colors, black, white, yellow, red, blue, and white. * You can take the 3 primary colors mixed with degrees of white and create any color you want. * The Color Scale gives you the correct proportions and ensures you recreating the same color every time. * You can also alter the color of the clay with many topical applications. * Lumina is an ivory translucent clay. * Hearty Clay is best used for paper arts. * Because is dries so lightweight, it’s wonderful for card making, Scrap booking, and altered art. * It can be used for jewelry making but should be rolled thicker for these projects. * Free form sculpting is made easy with the clay because it is so malleable. * It is great for flowers and whimsical figures. * Lumina dries lightweight, translucent, and with a flexibility to it. * Rolled thicker, it dries similar to the baked polymer clays and with the same hardness. * Lumina clay is great for jewelry making, doll art, home décor, and garden art.